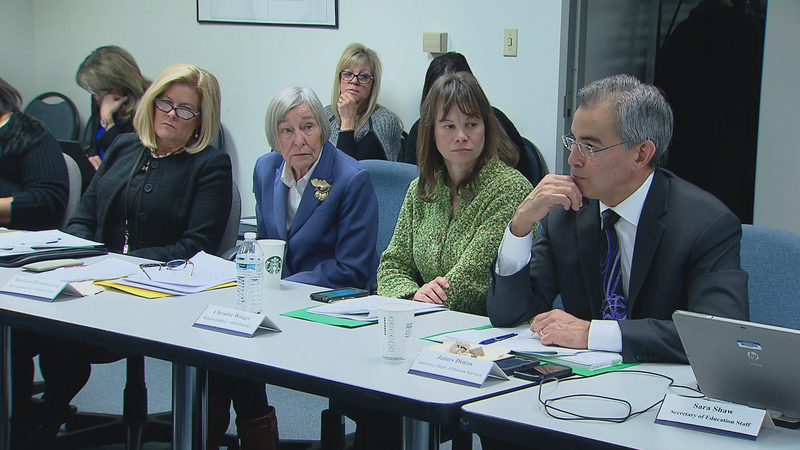 A group of lawmakers and state officials tasked with revamping the state’s education funding formula met Tuesday for the last time. Gov. Bruce Rauner created the commission last summer, giving lawmakers the job of developing legislation for reform – and Tuesday was their deadline. While there is no bill just yet, there is a report. Lawmakers are calling it a framework and say this is where the real work begins. The commission is made up of lawmakers from both parties and both houses of the General Assembly, along with several representatives from the executive branch, like the secretaries of both Education and Human Services. The commission is proposing an adequacy target for each school district, based on the needs of each district’s student population. And speaking of funding, the commission agrees that the amount of additional money the state will need for all districts to meet that adequacy target is $3.5 billion to $6 billion. And about Chicago teacher pensions, Currie says when writing legislation, lawmakers will have to figure that out. Should other districts start paying their own contribution for teachers’ pensions or should the state start paying for Chicago’s? A lot of questions remain on the table. But State Secretary of Education Beth Purvis, who Rauner asked to lead the commission, says Chicago Public Schools will be affected the same way as any other poor district in the state. “It will be to look at how we fund our schools, based on the characteristics of the children in them, based on the local available resources, and then to determine … how do we close that gap in a way that really helps our districts with the most vulnerable students first,” Purvis said. As to how the state could pay for it, Currie acknowledges the state will have to raise taxes to cover these additional costs. That means the future education legislation is contingent upon a grand bargain in Springfield. But Ralph Martire from the Center for Tax and Budget Accountability stresses that only a small tax increase would be necessary to raise that $3.5 billion. Martire adds that the state should phase in the new formula over several years. This allows the state and school districts time to scale up, and plan for those new resources, such as hiring new staff and finding the right programming and technology. Rauner commends the lawmakers for getting the state one step closer to fixing a funding system. But, some say, we still need a bill. And lawmakers could be getting additional pressure from the courts sometime soon: A lawsuit filed by the Chicago Urban League against the Illinois State Board of Education claiming the funding system is discriminatory is still working its way through the courts. But that suit was filed eight years ago, and that means eight classes of students have been graduating from districts that many agree is underfunded. Right now, there is a motion on the table for partial summary judgment in that lawsuit, but there’s no word yet on when attorneys for both sides will be able to argue it in court. By the way, the commission report urges the governor and General Assembly to work out issues and pass legislation in time to have a new funding formula in place for fiscal year 2018, which starts this summer. Jan. 31: In a split decision Tuesday morning, the U.S. Senate Committee on Health, Education, Labor and Pensions voted to approve education secretary nominee Betsy DeVos. Jan. 25: Board President Frank Clark said Wednesday that CPS has worked out a way to fill a $215 million void left in its 2017 budget. But the district says no final decisions have been made. Jan. 24: A team of Illinois legislators has spent the past six months looking for some way to fix the state’s broken education funding model. But with only a week left before its final report is due, concerns have surfaced about how soon any changes will be made.